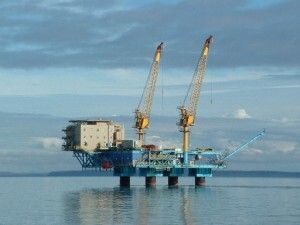 Miller Energy Resources platform in Cook Inlet, Alaska. Miller Energy Resources reported today a fourth-quarter loss of $13.1 million, more than half its loss for the full 2013 fiscal year. The net loss attributable to common stockholders equaled 31 cents diluted share, up from a loss of $8.4 million, or 20 cents per share, in the 2012 fourth-quarter, the Knoxville-based oil and natural gas company said. Revenues for the quarter ended April 30 tumbled 13 percent to $7.7 million, compared to $8.9 million in the same period the prior year. The company attributed the 4Q loss to a pump failure knocking one of its wells offline, fluctuating shipping schedules and other reasons. For fiscal 2013, revenues dropped 2 percent to $34.8 million and the net loss was $25.5 million, or 60 cents per share. Despite rising loses, CEO Scott Boruff put a positive spin on the Knoxville company’s outlook for the coming months. As revenues have declined in recent months, the company has tapped investors for increased funding. Miller has raised more than $32 million in three preferred stock sales this calendar year alone. Miller has exploration and production operations in Alaska and East Tennessee. This entry was posted in Miller Energy Resources and tagged Cook Inlet, fourth-quarter, loss, Miller Energy Resources, natural gas, oil, preferred stock sale, revenues on July 16, 2013 by Roger Harris. The analysts were wrong again. Scripps Networks Interactive second quarter earnings were better than expected, boosted by double-digit increases in advertising and affiliate fees. Earnings from continuing operations attributable to Scripps Networks Interactive increased to $142 million, or 93 cents per diluted share, up from $77.4 million,or 78 cents per share in the same period a year ago, the Knoxville-based lifestyle media company said Thursday. Analysts were expecting 87 cents per share. Revenues rose 13 percent to $601 million. This entry was posted in Scripps Networks and tagged earnings, Ken Lowe, revenues, Scripps Networks Interactive on August 2, 2012 by Roger Harris. Scripps Networks Interactive Inc. reported Thursday a first quarter profit of $115 million, or 73 cents per diluted share, compared to net income of $101 million, or 59 cents per share a year ago. Revenues for the quarter increased 11 percent to $535 million. The news boosted Scripps shares to a new 52-week high, up more than 5 percent to $53.38 in morning trading. The Knoxville-based lifestyle media company easily beat analyst expectations on both the top and bottom lines. Analysts expected a dip in revenue and earnings of about 60 cents per share. This entry was posted in Scripps Networks and tagged analyst expectations, first quarter, Ken Lowe, profit, revenues, Scripps Networks, Scripps Networks Interactive on May 3, 2012 by Roger Harris.